Restoring a vintage Shasta trailer, or any vintage trailer for that matter, can be a very rewarding experience. There’s nothing quite like taking your shiny “new” trailer out for its maiden voyage following months of blood, sweat and most likely tears. But, getting to that point can sometimes be a trying ordeal. It’s not rocket science, but it goes a lot smoother when you can find the parts you need to get the job done right. We’re fortunate that many of the parts we need like birch plywood and PEX plumbing parts are available at the local lumber yard, home center or hardware store. But, for parts that have been out of production for years, you can spend countless hours scouring ebay searching for a part that looks almost as bad as the one you’re replacing. I have been a Vintage Trailer Supply customer for years. In fact, I’ve even toured their facility. I am fortunate to live in New Hampshire, just a short road trip away from Vintage Trailer Supply’s location in Montpelier, Vermont. Steve runs a top-notch business and his parts are exceptional. He goes to great lengths to have hard-to-find parts remanufactured to exacting standards, using original parts as models. 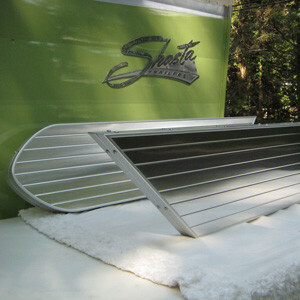 Steve and his team know vintage trailers and they know which brands used which parts in which years. The Vintage Trailer Supply website provides great product images and descriptions, along with customer reviews to give you real feedback from people who have already purchased the products. As I mentioned, I’ve been a customer for years and I’ve always been pleased with everything I’ve purchased. I’m sure you’ll be pleased, too. The Vintage Trailer Supply links below are affiliate links. That means if you click on one of my Vintage Trailer Supply links and make a purchase, I get a small portion of the sale for sending you there. But, don’t worry, you won’t pay any extra for clicking on my links.